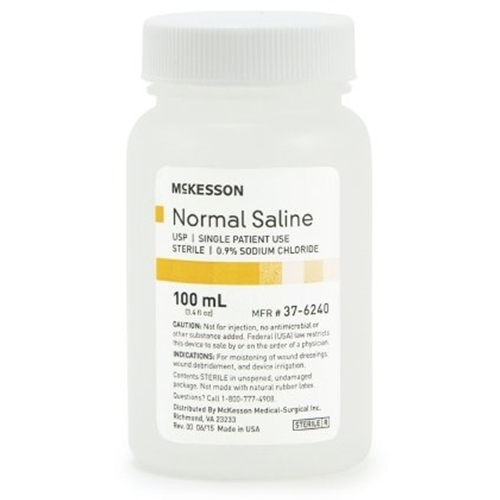 McKesson USP Normal Saline from HealthyKin.com is used for moistening of wound dressings, wound debridement and device irrigation. We are using this product for catheter care, specifically irrigation, alternating with sterile water (same size bottles, which we ordered a few weeks earlier), and the bottles are perfectly sized for twice per day use (half in the a.m., half in the p.m.), so that a new bottle is opened every 24 hours as recommended for sterile procedure. We ordered boxes of 48 of both sterile saline and sterile water. Very happy with the product and with your delivery schedule. The 16.9 oz. case of 18 is a good price for me. I use it as a wound wash. Product used by our home health nurse for dressing my husband's surgery wound. Now I have taken over the daily dressings. Simple to use and good price. Best price I could find and shipping was quick. Great product and fast shipping. I was hesitant at first but everything turned out to be perfect. Keep up the great work! We have been using it to irrigate the nose, and it works great. My mom nurse brings these but not nearly enough for her trach care. It is a God send that I can get these when I can. I am satisfied.